This serape, or cape-like garment, was most likely created in or near Saltillo, a town in northern Mexico famous for its weavings. Made of cotton and wool yarns, this serape measures about 8 feet in length (ca. 242 cm). Its design combines hundreds of small geometric forms, emphasizing, as was common, diamond-shaped lozenges and stripes. Saltillo serapes are famous for their "eye-dazzling" geometry, as seen here. Contrasting colors enhance the drama of the visual effect, with deep reds set against dark blues. The emphasis on vertical stripes minimizes the slight irregularity of the join running vertically down the center of the textile. The central lozenge, made up of concentric diamonds, seems to float against a background of narrow stripes. It is not certain whether this serape was used as a bed cover or a worn like a shawl—or both, at different points in its life. Given its patterns of use, it is likely the stripes may have been seen as horizontals and not, as they are here, as verticals. Serapes such as this one were most likely made in workshops by highly skilled weavers who were adept at creating the design and its mirror image on two different lengths of fabric, and then joining them. The designs, which are so distinctive of this northern region of Mexico, have a complex, and still poorly understood history. 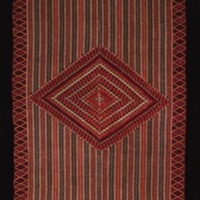 Scholars have suggested several origins: weavers may have adapted Spanish designs, some of which may have carried traces of Persian or Muslim patterns. Indigenous pre-Hispanic sources may have played a role (including imagery from the Nahua town of Tlaxcala, which sent settlers into the northern reaches of New Spain) and Chinese and Indian imports may also be part of the mix. Also important, of course, were the individual ideas and creativity of local weavers. The serape has been woven of cotton and wool threads, dyed various shades of red and blue. The deep red color here was derived from cochineal, the blue from indigo. There is an almost imperceptible difference between left and right sides, the result of being woven in two pieces, and then joined along the center. This serape is today in the Dallas Museum of Art. 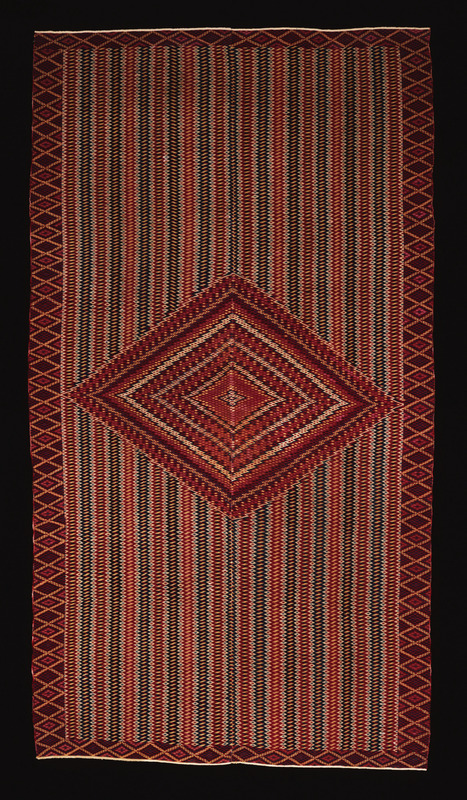 It was, of course, never created as a work of art, but Saltillo weavings were often collected in both Mexico and the United States, particularly in the 19th century. The popularity of Saltillo serapes burgeoned between 1800 and 1850. Saltillo patterns—easily seen as travelers moved through the Southwest—influenced Pueblo weavings from the Rio Grande Valley and Navajo textiles. After Mexico won independence, serapes became symbols both of Mexican nationhood and, because they were the traditional garb of horsemen, of the skilled horsemanship of Mexican men. Travelers purchased these blankets as souvenirs and U.S. soldiers who fought in the Mexican American War (1846-1848) often brought Saltillo serapes home. These textiles thus represent inventions from colonial New Spain that freely crossed ethnic boundaries and, ultimately, national borders. Dallas Museum of Art: A Guide to the Collection. 1997. Dallas: Dallas Museum of Art. Jeter, James and Paula Marie Juelke. 1978. The Saltillo Serape. Santa Barbara, California: New World Arts. Palmer, Gabrielle and Donna Pierce. 1992. Cambios: The Spirit of Transformation in Spanish Colonial Art. Santa Barbara, California: Santa Barbara Museum of Art.